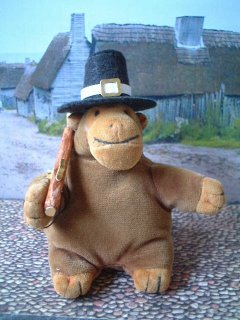 "I'm giving thanks, you know"
Mr Monkey wears his pilgrim's hat whenever he feels the need to give thanks. He's fully aware that it's anachronistic* and is more suited for the 1650's than the 1620's, but what's good enough for American cartoonists is good enough for Mr M.
*Have a look at the History Channel website if you don't believe us. Mr Monkey's pilgrim father's hat is made from felt, paper and gold card. His blunderbus is balsa wood, a drinking straw, gold card, gold paper (a fudge wrapper, actually) and a bit of a pin.